A new report produced by NASA raises the possibility that global warming may be enhancing the potential for what it’s calling Brown Ocean Cyclones. In such events, record rainfall and heat over land produce hot, moist conditions that may give rise to Cyclones that increase in strength even after they make landfall. A typical hurricane or tropical weather system usually rapidly loses strength once it comes into contact with land. The storms are fueled by a kind of heat and moisture engine. Warm, moist air over oceans hotter than 75 degrees provide big kicks to these storms as they roar across large stretches of ocean. Drier land masses provide less heat and moisture content to feed storms so they usually fade after crossing the coast. But, over the past three decades, researchers noticed a strange phenomenon — storms that strengthened over land. 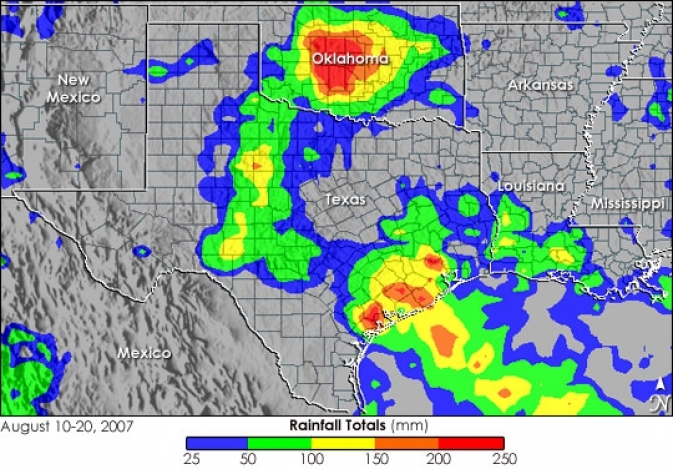 In one example a 2007 tropical storm named Erin crossed over Texas and Oklahoma. As she turned north into a region that had recently encountered record flooding and rainfall, Erin strengthened, maintaining tropical storm intensity for far longer than meteorologists had predicted. Tropical Storm Erin in 2007 was a warm-core TCMI, which can deliver much more rainfall than their extratropical counterparts. The newly described storm type derives energy over land from the evaporation of abundant soil moisture. Researchers later found that Erin had derived its energy from a high rate of soil evaporation in the regions it traversed after it made land-fall. Andersen and Shepherd [the report’s authors] show that a brown ocean environment consists of three observable conditions. First, the lower level of the atmosphere mimics a tropical atmosphere with minimal variation in temperature. Second, soils in the vicinity of the storms need to contain ample moisture. Finally, evaporation of the soil moisture releases latent heat, which the team found must measure at least 70 watts averaged per square meter. For comparison, the latent heat flux from the ocean averages about 200 watts per square meter. The new research found that of 45 storms that maintained or increased strength after they made landfall, 16 did so under the conditions described above. 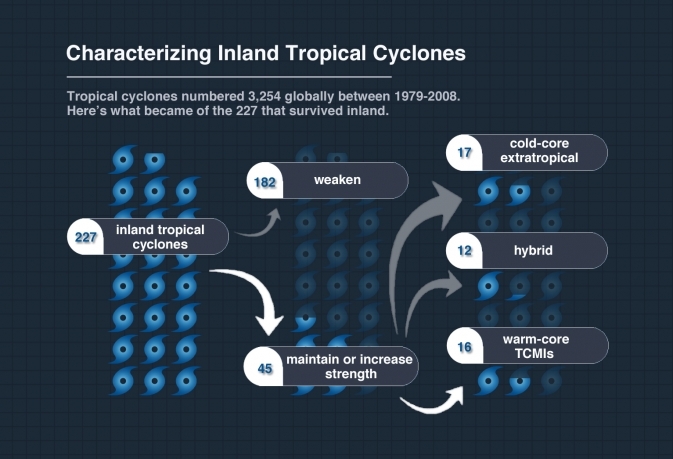 These conditions resulted in a new category for inland storms — tropical cyclone maintenance and intensification events or TCMIs. Though NASA scientists do not mention the potential for global warming to create and enhance the occurrence of such storms, it is important to examine if the forces set in place by human caused warming and climate change will result in greater instances of such storms. To this point, global warming increases the evaporation and rainfall driven hydrological cycle by 8% for each degree Celsius of atmospheric warming (Lawrence Livermore). And as this new type of inland cyclone is driven by the intensity of evaporation and heat forcing (70 watts per meter squared or more) over land, then meta analysis would seem to indicate a greater risk for such events as Earth heats up and churns more moisture into the atmosphere. Doing some, rather basic, math we find that a 4 degree Celsius warming creates a 32% intensification in the hydrological cycle, resulting in a greatly increased likelihood that tropical systems moving over land will encounter conditions consistent with TCMIs. This new risk adds to the likely increased frequency of storm hybridization events, like Sandy, where meandering flows in the Jet Stream (caused by Northern Hemisphere sea ice loss) encounter tropical systems to create monstrous Frankenstorms. So we have not one, but two indirect methods where global warming may intensify or extend the duration of tropical cyclones. Perhaps more ominous, global warming also provides a direct means through which storms are both induced to form over longer periods during the year and are given added fuel for intensification. This amplification of the ocean heat engine that drives powerful storms comes from the increasing temperature of the ocean surface through human-caused warming. In such cases, both the added atmospheric and ocean warmth and the increased hydrological cycle come directly into play resulting both in the potential for stronger storms and for an increased period of time in which tropical cyclones can form throughout the year. The end result may be hurricane seasons that last from April or May to November or December in which storms with access to added fuel to feed their intensity may increasingly link up with Arctic weather systems to blow up into massive storms or persist or even strengthen for long periods over land. These are important risks to consider as the Earth warms and the heat and moisture engine that drives these powerful storms continues to intensify. What does cold-core extratropical, hybrid, and warm-core TCMI’s mean in the graph? What is the core? Also, are you saying that winter weather systems and warm air weather systems collided because they usually exist farther apart in terms of season/time period (on the East Coast), and that that’s why created Superstorm Sandy? I remember that in NY, our winter weather (inc snow) lasted a lot longer than usual. Tropical storms that derive their central energy from heat are called ‘warm core’ systems. The temperature differential that drives their wind patterns is hot, rising air in the center. Cold core systems derive their energy from cold, falling air near their center and warmer air around their outer edges. Sometimes, two of these storms can combine in what is called a hybrid storm — this happened with Sandy. The reason why there is increased risk for storms like Sandy is due to the fact that the polar jet stream that drives weather systems now tends to dive very far to the north before plunging very far to the south. In doing this, it can pull cold core systems from the Arctic and bring them farther south than normal. If a warm core system is coming north just as the cold core system is diving south, then you have hybrid storm like we saw with Sandy. In short, global warming creates conditions that make hybrid storm formation more likely. TCMI’s are also more likely due to the fact that the extra heat causes more evaporation which drives the brown ocean events causing the potential for warm core storms to strengthen over land. Hope I’ve explained this well enough. Will work to simplify it more in another post. I get it now! I have just one more question: are cold-core systems tornadoes? Or are they more like blizzards? Here in NY, we sometimes get Nor’easters. Those are giant blizzards that can last 4 or 5 days and dump many, many feet of snow at a time. When Sandy was on its way, there was a Nor’easter that was also heading our way from the West- it seemed to me (though the meteorologists didn’t explain this that much) that the Nor’easter combined with the approaching hurricane from the south. We have never (at least in my memory and that of anyone else I know) had more than a bit of flooding and torrential rain for a 2 or 3 days from a hurricane going on in the south. Most of the time, though, hurricanes barely touch NY.